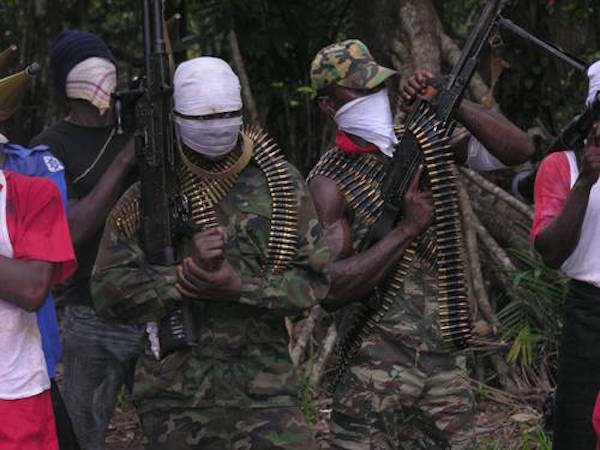 A coalition of Niger Delta militant groups rose from a meeting in Port Harcourt, Rivers State yesterday ordering all northerners to quit the oil-rich region. The militants threatened to attack all oil wells owned by northerners in Niger Delta before October 1, 2017. The groups, under the aegis of the Coalition of Niger Delta Agitators, berated the Acting President, Yemi Osinbajo, Inspector General of Police, Department of State Services and the Army for not arresting those who issued an ultimatum to Igbo to leave the north. This development has stoked the tension that is threatening to tear the nation apart. The government which has initiated a peace process may have to increase its parleys with stakeholders to avert the threats to the Nigerian union. At the joint meeting between the Coalition of Niger Delta Agitators and youth leaders across the region to review the state of the nation, the militant leaders demanded an immediate return of oil blocs owned by northerners to the Niger Delta people. Among the groups and their leaders that endorsed a joint statement issued after the meeting were: Gen. John Duku (Niger Delta Watchdogs); Gen. Ekpo Ekpo (Niger Delta Volunteers); Gen. Osarolor Nedam (Niger Delta Warriors); Major-Gen. Henry Okon Etete (Niger Delta Peoples Fighters); Major-Gen. Asukwo Henshaw (Bakassi Freedom Fighters); Major-Gen. Ibinabo Horsfall (Niger Delta Movement for Justice); Major-Gen. Duke Emmanson (Niger Delta Fighters Network); Major-Gen. Inibeghe Adams (Niger Delta Freedom Mandate); and Major-Gen. Ibinabo Tariah (Niger Delta Development Network). The militants also threatened that all oil and gas companies operating in oil wells illegally owned by northerners should vacate such blocs, wells and platforms before October 1, 2017. “We condemn in totality the meeting held by the Acting President with some northern elders and youths. We see it as a grand conspiracy. A responsible government should have arrested those traitors, but our government rather turned round to meet with them and pleaded for peace; does the Nigerian government see people from other zones as second-class citizens? Why are they more important to the Acting President, why is it that the Nigerian law is always weak when it involves the northerners? We are still watching the unfolding events with keen interest,” the militants said. They said it was not surprising that the Inspector General of Police, Department of State Service and even the Army failed to arrest any of the northern youths who issued similar threats for Igbo to leave the North before October 1, 2017. The militants said they were fully prepared to declare the Sovereign Republic of Niger Delta on October 1, 2017, and therefore called on all their compatriots to remain focused, united and steadfast. According to them, the liberation of the people of the region from the alleged slavery of Nigeria remains their primary target. “We want to sound this as a warning to all the northerners living in Niger Delta to quit our land before October 1, 2017 as this is not just a threat. After October 1, 2017, any northerner found within the Republic of Niger Delta shall be seen as an intruder and shall be treated as such. “We also use this opportunity to advise oil & gas companies in our territory to shut down further operations, PENGASSAN and NUPENG to warn/withdraw their members from Niger Delta before October 1, 2017 or risk their lives. Our next action will surprise you,” they said. The groups also demanded the immediate relocation of the Nigerian National Petroleum Corporation (NNPC) headquarters to Niger Delta and replacement of the Group Managing Director of NNPC with an indigene of Niger Delta region. According to them, all offices, boards and agencies that have anything to do with oil and gas should be relocated immediately to Niger Delta and all non-Niger Delta directors, staff be replaced with the indigenes. Meanwhile, Acting President Osinbajo will next week convene a joint meeting of northern leaders and their Igbo counterparts in continuation of efforts to resolve the impasse and tension created by the quit notice to Igbo people living in the northern part of the country by the Arewa youths. The President-General of Ohanaeze Ndigbo, Chief Nnia Nwodo, who stated this yesterday, appealed to the Igbo to remain calm and patient in the face of the tension created by the ultimatum, noting that Osinbajo had allayed their fear and assured them that the Federal Government would be fair to all. Nwodo, who was accompanied by some Igbo leaders, including the former governor of the Central Bank of Nigeria (CBN), Prof. Charles Soludo and Bishop of the Catholic Diocese of Nsukka, Most Rev. Prof. Godfrey Onah, spoke as they arrived at the Akanu Ibiam International Airport yesterday from Abuja. He told reporters that the acting president copiously offered explanations to the Igbo leaders on the areas of concern they had raised, including their perceived feeling that the Igbo were being treated as second-class citizens in their own country. Meanwhile, Osinbajo and the Emir of Kano, Muhammad Sanusi yesterday met behind closed doors at the Presidential Villa, Abuja. The Emir was said to have arrived at Osinbajo’s office at exactly 2:40p.m. The meeting lasted until 4:50 p.m. when Sanusi emerged from Osinbajo’s office with a few palace aides who accompanied him. The Emir declined to comment when State House Correspondents approached him but proceeded to exchange pleasantries with some presidential aides and workers in the Vice Presidential wing of the State House. There was no official communication from the Presidency yesterday to explain the visit as at press time. Osinbajo began a series of meetings with stakeholders, leaders of thought from the northern states of Nigeria on Tuesday.